We were out at sunrise again, pausing to look at two red-necked falcons near Namutoni. There were lots of plains mammals around, all looking relaxed so last night’s lions must have been elsewhere. A superb male kori bustard with neck feathers fluffed out gave an impression of haughty arrogance as he walked slowly into the bush. After a relaxed cooked breakfast, we packed and headed west towards Okaukuejo (pronounced Ok-a-koo-yoo). There were quickly interesting sightings: a black morph Gabar goshawk, chestnut-bellied sparrowlark seen well this time and purple roller. These were merely appetisers for the full Africa experience. 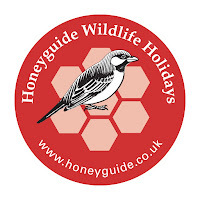 We reached a point where we were surrounded by zebras, with good numbers of impala, wildebeest and springboks, a sprinkling of giraffes and a herd of our first red hartebeest. This was near a waterhole that none of the plains mammals were approaching, so it’s likely that there was a lion there. The zebras milled around us and cameras clicked. To be in the middle of so many mammals was an extraordinary experience and was a holiday highlight for many. Surrounded by zebras (David Bennett). We enjoyed this for a good while, and when it was time to move our next stop was another waterhole after driving through mopane shrub, leaves coloured like beech leaves in spring and with a distinctive split shape like a camel’s hoof or a Montpellier maple seedpod. A black-chested snake-eagle was perching prominently and a second eagle appeared. A male painted snipe was a surprise – the male being the duller gender – and there was a marsh sandpiper next to a wood sandpiper for easy comparison. We had lunch at Halali, accompanied by scores of super-tame Cape glossy starlings looking out for bits of toasted sandwich. Gill was alert to a southern white-crowned shrike in the trees and there was a tree squirrel. We were then driven a short distant to the Halali water hole, with a short walk to a tiered seating area. It was hot, very hot, as we watched elephants, cinnamon-breasted buntings and a group of yellow-rumped yellow canaries. 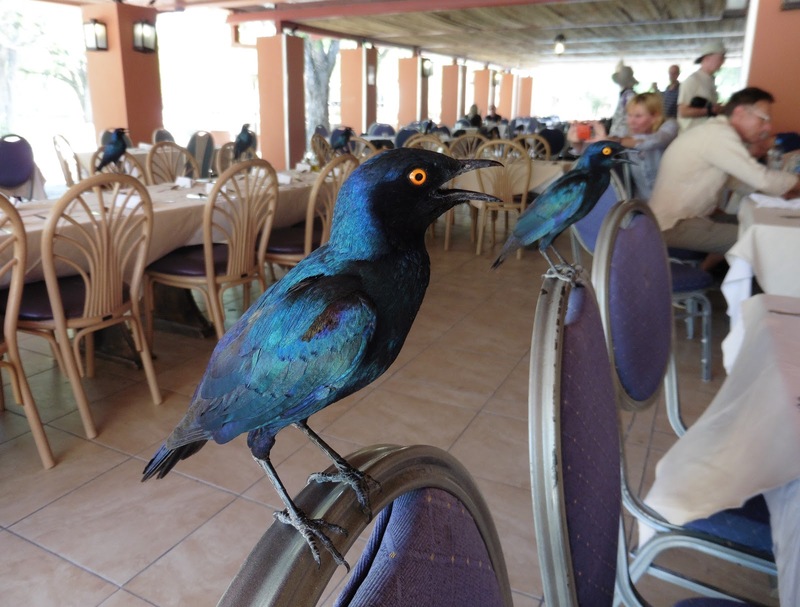 'Do take a seat': Cape glossy starlings on every chair back at Halali where we stopped for lunch. Heading west again on the dirt road, there were two vehicles plainly watching something. 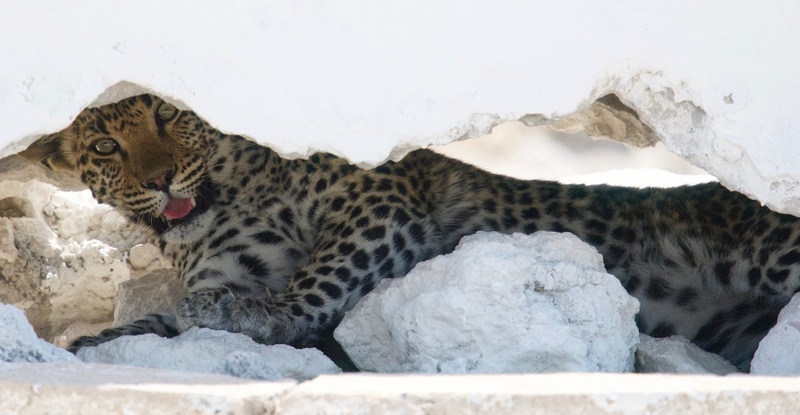 It turned out that there was a young leopard in a hole under a stone road sign saying ‘detour 8km’. An extraordinary stroke of luck to add to today’s star sightings. Leopard under a road sign (Tim Hunt). A final water hole had a male lion lying down in vegetation in the middle. A drinking giraffe had the perspective of height to see him there. A black rhinoceros came in from the right and proceeded to roll on its side to get caked in mud. In the meantime a young impala, on its own at first, came to drink. The lion stayed low and the impala seemed unaware of its presence. Inevitably thoughts turned to whether a kill was coming, but it didn’t. The impala, now with others, moved on. A secretary bird was also in the same binocular view as the giraffe and the rhino; also there were tawny eagles and our first Cape crows and Cape teals. Then on to Okaukuejo and to our chalets, very close to the waterhole. There was no electricity when we arrived but it came on later that afternoon. Having twice lost water at Namutoni, being patient with this kind of glitch is all part of being in Africa. There was time to settle in and spend time looking at wildlife around the waterhole, with flashes of lightning with accompanying thunder producing just a few drops of rain that evaporated in an instant. Most returned to the waterhole again after dinner when the floodlit area had three black rhinos, two giraffes, at least three jackals and five barn owls. Skimming nightjars gave the ‘tuk tuk’ call of freckled nightjar and a large scorpion played dead on the path. 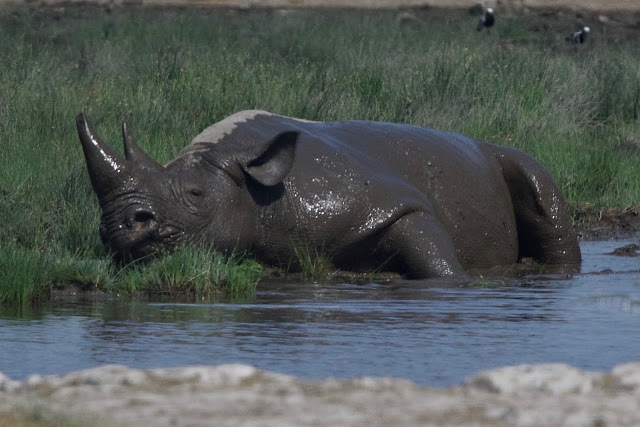 A black rhinoceros ... proceeded to roll on its side to get caked in mud (Cheryl Hunt).